NOAA’s Global Historical Climatology Network (GHCN) publishes 3 different monthly temperature sets for each of the ~7000 weather stations. 1) Average Temperatures 2) Minimum Temperatures 3) Maximum Temperatures. Seasonal variations are averaged out over a 30 year normalisation period to derive so-called ‘temperature anomalies’. This is done by subtracting the 30-year monthly averages from each temperature value which causes temperature trends to zero at the normalisation period. Normally only the average temperature (Tav) anomalies are presented, but I decided to analyse all three. These are the results for global temperatures (including oceans). Fig 1. 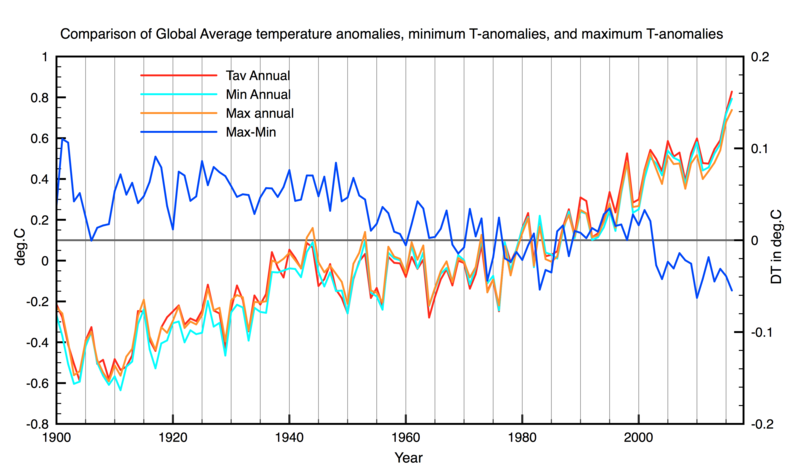 Comparison of temperature anomalies normalised to 1961-1990 for a)Tmax b)Tmin c)Tav. All curves pass through zero around 1975 due to the chosen normalisation period. The difference Tmax-Tmin is shown by the blue curve which is plotted versus the right hand Y-scale. A reduction in Tmax-Tmin of about 0.1C is observed since 1950. Minimum temperatures always occur at night over land areas. This means that nights have been warming faster than days since 1950. The effect is actually much larger than 0.1C because nearly 70% of the earth’s surface is ocean with just single monthly average ‘anomalies’. So nights over land areas have on average warmed ~ 0.3C more than daytime temperatures. If we assume that average land temperatures have risen by ~1C since 1900, then maximum temperatures have really risen only by 0.85C while minimum temperatures have risen by 1.15C. This effect may also be apparent in equatorial regions where the night/day and winter/summer temperature differences are much smaller than at high latitudes. Figure 2. 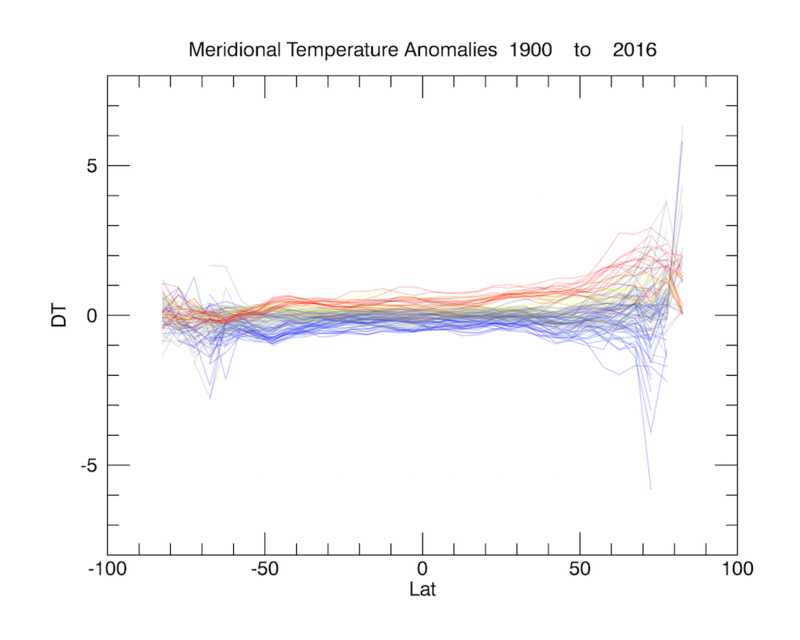 All 117 meridional temperature anomaly profiles from 1990 to 2016. They are coloured blue if the annual global anomalies < -0.2C, Blue,-0.2<grey<0.2, 0.2<yellow<0.4, red > 0.4. Traces are 80% transparent to view them all. Radiative cooling of the land surface mostly occurs at night. It is much greater when the air is dry such as over desert regions and at the poles. During the day convection and evaporation dominate heat loss. Enhanced CO2 reduces slightly night time cooling efficiency. UHI is also larger at night. This entry was posted in AGW, Climate Change, climate science, NOAA and tagged Climate Change, GHCN. Bookmark the permalink. There is also an apparent change of “regime” if you look separately sea and land. From 1880 – 1900 they go in opposite directions (but the data must be very bad). From 1900 to about 1985 land and sea go hand in hand. From about 1985 the land warms at double the sea rate. Measurements are crazy? Three different things are happening to the system? You’re right. There is something very strange about the land warming faster than oceans. That cannot continue indefinitely or there would be huge onshore winds and there is no evidence for that. The use of anomalies can cause some strange effects because ‘temperatures’ are normalised to a fixed period. The long term (i.e. 1880-present) land/ocean warming contrast is actually close to model expectations for a ratio of about 1.8 for landSAT/oceanSST in a 60S to 60N “globe” (Things get a bit complicated if you include the Arctic). Over shorter periods the warming ratio can vary due to both internal variability and external forcing factors. For the latter, volcanic forcing in particular will tend to produce a considerably stronger effect on land temperatures. I think the most recent 30-40 year period is on the high side for the observed warming ratio. I’m not sure exactly what you’re expecting with regards winds, or if that is actually an expectation associated with long-term warming contrast, but RSS has a satellite wind speed product which indicates a general increase in coastal/off-shore wind speed over the past 30 years. The trend for 1988-2016 looks remarkably similar to that of the temperature profile of El Niño events. Given that the greater a temperature gradient the greater commensurate winds, I find the idea that the most obvious sign of “general increase in coastal/off-shore wind speeds” is over open water in the Pacific where there should be less of a temperature gradient to spur any increase. 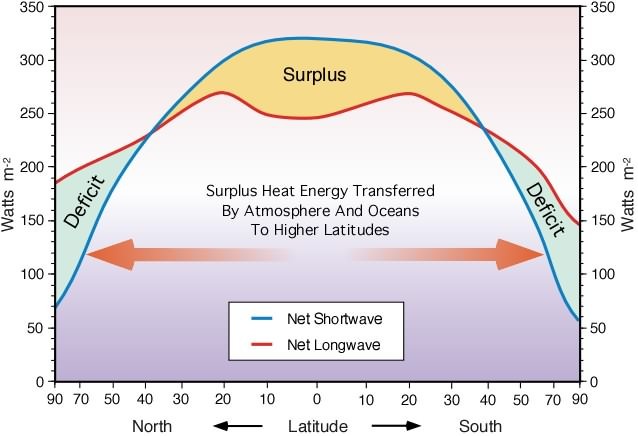 If the diurnal temperature range DTR decreases for both enhanced greenhouse effect EGE and urban heat island effect UHIE perhaps the two could be resolved by the differences in the polar regions and oceans where there are no urban effects. To clarify, let’s assume that there is a latitudinal trend of DTR from tropical SST to polar SST. One would expect this same DTR trend to hold for tropical land surface temp to polar land temp. So, for example, if the tropical SST DTR trend 1950-present is zero and the polar SST DTR trend is .05C per decade then one would expect the same ratio of trends for land temp DTR from tropics to polar. The difference would be DTR caused by UHIE. Yes it would be worth looking at latitude dependence of Tmax-Tmin. Of course at the poles themselves there is only one day and one night per year. Over land UHI warming can only be seen if urbanisation is increasing with time. In other words a warmer city just gets renormalised to zero when doing the seasonal average in the normalisation period. The past appears cooler if the city density grew from 1900 to 1970 and warms faster afterwards if the growth continues past 1990. One of the best examples of this is Sao Paolo which grew from a village to a mega-city in 100 years. It’s already established that UHIE causes narrowing of DTR and narrowing of winter to summer range. The question is whether this signal shows up in the overall land data wholesale. Certainly the individual UHI studies of Seoul, Brussels, Bankbook, Tokyo and others could be used to validate the effect. Strangely, the CS community hold the opinion that UHI does not affect the record since they cannot find it statistically after they do their homogenization. Rural groups rise at the same trend as urban (except in the USA). Peterson was the hero that made UHI disappear just after it was starting to be addressed by Karl and Hansen. The history of the handling of UHI by the climate science authorities I found very interesting when I looked into it reading Parker(2010). It was mostly brushed off until Karl 1988. . Karl finds UHI in the USA record in cities of population as small as 2000, with an annual temp elevation of 0.13C from a .12C rise in Tmin and 0.01 fall in Tmax. In cities over 10M the Tmax fell 0.55C and Tmin rose a whopping 5.63 C over its rural neighbors. As I understand it now CRUTEM does not adjust for UHI. GISTEMP does but there are as many negative UHI adjustments to as positive so they cancel. BEST, with its computerized check for breakpoints, chops records when a station move is detected but has no logic to find a slowly growing temperature bias like urban sprawl. The result is that weather stations that were moved to the outskirts simply get a chance to bias the record a second time as the urbanization gradually catches up with them. Actually, there is significant UHI found in Antarctica, of all places. I guess anywhere civilization goes it brings local warming. I am pretty sure the NH gap will be larger. The SH is dominated by oceans which don’t have a diurnal temperature difference. You’ve largely talked about Tmin/Tmax difference as an enhancement of Tmin. This may seem intuitive, and “nights warm more” is a common belief with regards to how the greenhouse effect works, but from what I’ve seen of the literature it’s generally considered a small to negligible part of the Tmin/Tmax story. Instead the difference is more ascribed to a damping of Tmax via the small negative shortwave components of CO2 and water vapor plus the effects of aerosols and their cloud interactions. Measurements are tricky. Crutem’s Tmax-Tmin data shows a similar overall magnitude DTR decline, but variance shows differences I think. Berkeley Tmax-Tmin shows a considerably larger decline down to the 1980s, then an uptick to present which isn’t evident in the other datasets. UHI may be a factor but also station movements/changes tend to have a much greater effect on one or the other of Tmax/Tmin. Actually, detected station change effects of opposite sign are not uncommon. There is a rule of thumb in meteorology that the lighter the winds, the more important local effects become. Given that Tmin occurs mostly, though not always, near dawn, and that Tmax occurs mostly, though not always in late afternoon. And given the lighter surface winds of dawn compared to the turbulently higher winds of the afternoon, Tmin tends to be more influenced by local effects than Tmax. 1. For each complete station year ( data for each month ) calculate the standard deviation. 3. For the spatial analysis, compute trend(s) of variance. You’re probably right. Tmin is more influenced by radiation cooling whereas Tmax is dominated by heat transport caused by convection. Tavg = (Tmax-Tmin)/2 is a mixture of changes in advection and in CO2/H2O. In the next few weeks I will try and look at the station data in more detail. their databases and results. Then read the sites the explain how the instrumentation actually works (or not as the case may be). For example, separate from the many “administrative adjustments” (i.e. manipulation) of “surface instruments”, HadCRUT4 is actually CRUTM4 + HadSST3. for the sea based instrument (i.e. they DON’T USE AIR TEMPS). So, amongst other things, the land portion of the temps is for “air”, while the SST portion is for “water”. … THOSE ARE FUNDAMENTALLY DIFFERENT THINGS, and impacted by all manner of complications, such as evaporation/condensation/freeing/thawing plus current, wave, PDO etc etc etc effects. The actual data in HadSST3 is from ICOADS, and the “quality/meaning” of those results is highly dubious. Just check any single instrument for down time etc. Moreover, while they claim thousands of instruments in the sea, at any one time you are lucky to have 400 – 1,200 over the entire planet’s oceans (and not 100% continuous in operation), and most of those are closely packed together etc etc, with only a tiny percentage of sea instrumentation in the SH (i.e. if half of the world’s oceans). That is, the actual coverage is rather poor. The actual distribution of the SST’s instruments IS NOT a nice uniform 5×5 grid. That is simply an artefact of various grotesque manipulations to square peg a round hole by Had/Met et al. The satellite data tends not to have these land/sea “curiosities” in any particular material manner, nor any distributional issues of any sort. These issues, as with so many other issues, is a “surface instrument” matter. … I started a note regarding your spherical triangulation illustrating errors there, and connected to these points as well, that will follow in due course. A simple illustration for Black body calculations is shown below for a selection of temps, plus two rows of “Diff’s” showing the flux differences as a function of temp. Notice that low temp (e.g. at 250k) has low radiation (221 W/m^2), while high temp has (non-linearly) higher radiation. Thus the day time temp of the Sahara might be around 310+ K, which is throwing off 524+ W/m^2, cf. night time temp might be 10 – 20 K or more lower, and thus night time is throwing off around 400 W/m^2 or less. So, day time radiative loss is about 124 W/m^2 GREATER compared to this night time comparison. So it is the day time radiation that is much bigger, not the night time. … yes, we could discuss instead the “net flux”, and brings us back to examining the heat balance, and away from the “too close to the forest for trees” with temp departures of average of the average of the average from dubious sources. … when the day time can throw off massively more heat compared to night, it is not surprising that day time warming would be more difficult for more or less fixed in-flux. FYI, I include the “Diff+10” and “Diff+2” fluxes, meaning the difference in flux for a 10K and a 2K increase in temp. Notice that even at very low temp, a 2K (or 2C) increase causes the “Black body planet” to throw off about 8+ W/m^2 more compared to the 2K cooler planet. … so, if all this CO2 radiative forcing malarkey is 2 – 3 W/m^2 according to Hansen, Schmidt et al, how is it possible for the planet to warm 2C if the radiative forcing is only 2 – 3 W/m^2, but at 2C warmer the planet throws off 8 – 12 more W/m^2 (i.e. where is the missing 5 – 9 W/m^2 coming from)? In reality, the planet is not exactly a “black body” and there are other considerations, but surely we can’t simply focus on “temperature anomalies” of averages of averages … in isolation. Then, for example, the change of water vapour concentration since 1949 implies a requirement of about 5 W/m^2 via a “back of the envelope” latent heat calculation under the assumption that the entire change in the WV content is due to evaporation. Thus, if that holds, then how does 2 – 3 W/m^2 “forcing” account for this portion of the heat balance. We could expand to this all the other non-temp heat transfer matters (e.g. life, etc etc). Curiously, it is possible that the WV increase is actually due, at least in part, to combustion. The by-products of burning carbon fuels are (in a perfect burn) xCO2 + yH2O, where x and y are the respective number of moles/molecules. In virtually all combustion y > x. So combustion is actually producing more WV compared to CO2, and WV is 4 – 15 times more powerful a GHG compared to CO2. One has to wonder why the IPCC et al never highlight this .. my guess is that introducing the truth about heat balances and critical processes would make for a “less clean sound bite” for the UN/IPCC’s wished for scenario, and the truth would complicate (dilute 🙂 their story. BTW, all of the “surface based” data sets tend to show “asymmetric” warming during el Nino’s, and they tend minimise the peak effect of el Nino’s, as can be easily seen from the ONI index. The satellite data show symmetry in ONI/temp for el Nino’s. Indeed, the land instrument el Nino asymmetry is much worse compared to the sea el Nino asymmetry. However, it is already possible to see the symmetry forming from the current giant el Nino in the satellite data. While it may require another few months to confirm, it looks as if the satellite data will show a very much extended “pause”, and thus a much increased divergence between the satellite and surface temps anomaly trends. Put differently, if there had not been any or appreciable el Nino’s in the past 20 years, there would have been no material increase in GAT. … what will happen then to all this temp averaging nonsense, when two completely independent instrumentations are diverging at an alarming rate, one showing massive warming and one showing essentially no warming (not that GAT is particularly meaningful, but that’s for another day)? … I am looking forward with glee to see what spectacular spin the UN/IPCC et al will put on that sort of outcome (i.e. if/when more data further crushes their rhetoric) … perhaps will this see in as little as 3 – 6 months. …when the day time can throw off massively more heat compared to night, it is not surprising that day time warming would be more difficult for more or less fixed in-flux. Dr. O, I’m not an atmospheric physicist but aren’t the daily TOA dynamics somewhat isolated from what is happening at the surface? I agree on the exponential relationship of TOA temperature to its radiative flux but since the TOA temp is ~70K less than the surface this effect is muted. On the divergence of the satellite lower troposphere temperature indexes from the surface thermometers, part of that could be due to that the lower troposphere is more correlated with Tmax due to afternoon convection currents and winds kicking up the boundary layer air to the LT. The other part, of course, would be lack of UHI bias and fiddling with historic ship measurements when measuring temp the in LT. I am not sure if I have understood your position. Are you suggesting that the (bulk) of the planet’s radiative flux is produced by the “three or so” gaseous molecules at 50,000+ feet? To be clear, the “TOA concept” (it doesn’t actually exist in reality) has some (very small) occasions when its oversimplifying assumptions provide something useful. For the most part, people seem to completely misunderstand/miss-use TOA. The TOA has (virtually) NOTHING to do with the radiative flux generated by the planet. In fact, essentially the entire atmosphere of the planet has virtually nothing to do with radiative heat flux source/generation. The entire atmosphere has (relatively speaking) almost no mass, and even less heat capacity, and gases cannot create/support the conditions required (see below) for radiation of the type in these matters. The mass/heat capacity of land/water is thousands of times greater, and liquids/solids can provide the conditions necessary for, say, something similar to idealised Black body source. Moreover, gases volumes don’t produce black-body radiation. Generally, Black-Body radiation is for solids, liquids (and sometimes we use “Grey body” models), and sometimes for plasma at high enough density (e.g. the Sun). You will need to learn a bit about quantum mechanics and statistical thermodynamics to understand the conditions under which a collection of electrons/nuclei can sustain radiation (i.e. the type of (atomic) “oscillations”) of the sort the planet emits. Put simply, what ever arrives/passes through the “TOA” has come from the surface of the planet. The temperature at the TOA has (essentially) nothing to do with the Planet’s flux. If there was no atmosphere at all, the flux/spectrum that satellites would pick up would very nearly what they pick up now, save for the narrow absorbed bands (mostly H2O with its wider range and greater number of possible “oscillations”, some CO2 at 14-16 microns) that would be “full” in the absence of an atmosphere … just think, what would a very large cannon ball radiate, v.s. a tiny bit of gas? So, once again, it is the temperature at the surface that is important, and virtually nothing to do with the TOA (even if such a thing existed). You can prove this for yourself by an alternate approach, without requiring quantum mechanism etc. There are plenty of satellite spectral readings available on-line showing spectra from different portions of the planet. Some from the oceans, some from the Sahara, and some from the poles, etc. (in fact you can dload ERBES, CERES, etc and create your own plots). The ones from the poles are massively less intense compared to, say, from the Sahara. If it was a TOA driven process, those two would be almost identical. But they are, in reality, very different since there is a massive difference in the surface temp of the Sahara vs., say, the Arctic cap. If you measure the area under the curves of those (real) spectra, you will find they match up very nicely with Planck et al based on the relevant surface temp (e.g. the close to the table values I provided earlier). Dr. O, I am taking from your comments that you do not accept the enhanced greenhouse effect, which is the basis of the current day “global warming” or “climate change” alarm. Although I am skeptical of claims of water vapor and cloud feedbacks amplifying the warming effect 200%, as projected by the IPCC’c climate model ensemble mean, I believe that doubling CO2 causes a theoretical warming of the surface of ~1C to stay in the same radiative balance. The 14-16 micron segment I realize is just a small portion of the spectrum but it is located in a critical spot, near the top of the curve of the planet’s outgoing radiation. The fact that CO2 is very opaque to this wavelength and that CO2 is of significant concentration at the TOA, hypothesizes an insulating effect. Radiation flux at 14-16 microns is being impeded thus the CO2 gatekeeper for this segment becomes elevated in importance. Where do you disagree? I am millions of others would be very welcoming of a new insight. I get the feeling we are talking at “cross purposes”. My comments Re “Black Body (BB) etc” radiation have NOTHING to do with whether one accepts the GHG theory or not. GHG theory is in relation to radiation that is ABSORBED by (a tiny) number of molecules in the atmosphere. BB is about how/why a body can EMIT radiative fluxes. In the climate context, this means how much radiation is radiated by the earth (surface, land, water, etc), since, amongst other things, gasses cannot support the conditions needed for BB etc (i.e. (normal) gases can’t radiate in the BB sense). … those are two completely different things. However, as you mention it, I think there is probably a SMALL (cap letters for “small”, a bit ironic 🙂 )amount of GHG contributing to Climate Change (CC). The science shows H2O is WAY more important compared to CO2. CO2 is the focus for political reasons, not science. … incidentally (a digression on your comments), separate from the fact the H20’s absorption cross-section is massively greater compared to CO2, and that there is “way more of it”, the ever “over sold” CO2 14-16 micron band actually over-laps with H2O … since there has been a substantial increase in H2O also, why would they restrict to CO2 only at 14-16? … of the 14-16 band is virtually completely saturated, so by the Laws of Thermodynamics, increasing CO2 (or H2O) won’t make (virtually) any difference at 14-16 microns (only a very tiny bit due the band width implications as a function of temp). … and I have seen all those but CO2 “causes” H2O arguments, and, though for another chat, that is utter nonsense. 1) We (humans) know far too little to be able make any kind of a statement about the dynamics of the climate in the context the UN/IPCC et al would wish to believe. Indeed, what little we know, has much too little data (in reality no data set can be used that pre-dates 1,980, and that is FAR too short, for example, to determine PDO etc.). We have no data WHATSOEVER on the heating from the core, on the effect of the motion of the magnetic poles, effect of tectonics, the effect of cosmic rays (as per CERN’s finding) … etc etc. … it is, in fact, very much worse, since the climate can be shown to have fractal properties, which immediately shoots the data requirements completely out of the galaxy, and likely out of the universe. 2) We can prove (and this is what I do for a living, and in a commercial setting … much tougher compared to academia) that it is, for all practical purposes, IMPOSSIBLE to forecast the climate (in the UN/IPCC context). It is not that we don’t have enough math geeks or supercomputers, rather, it is written into the fabric of the cosmos (i.e. some phenomena “defy predictability” almost as king of raison d’etre). That is, the universe won’t allow forecasting in the context the UN/IPCC et al would like to believe. 3) Even if the maths could predict, say, GAT 50 or 100 years out, it would be still COMPLETELY MEANINGLESS, since there is NO POSSIBLE way to know the ramifications for mankind. The last 100+ years have seen global warming, and yet, has been … and by a very large measure … the single greatest expansion of human welfare and standard of living in recorded history. … If that is AGW, then “bring it”, but of course we cannot predict future. …how come only the “doom gloom” fear-mongering scenarios are considered,and to the explicit and forceful exclusion of even the possibility that the future might be like the past? … oh, how I lament. Dr.O, I lament also that science has been hijacked and is being molded for political purposes. I did not see anything in your reply that refutes the EGHE with evidence. The back radiation that Nick Stokes cited from Petty’s book is a hard point to refute. It is not disputed that water vapor is a powerful GHG and overlaps CO2 radiation bands significantly. The issue is that water vapor is not evenly distributed thus in the areas where it is less than a few ppm CO2 dominates. The TOA is one of these areas and it is a critical one since 14-16 micron radiation has its only chance to escape to space at the TOA, or more specifically, the effective height of CO2. As the concentration of CO2 increases at the TOA the effective height also increases, which locates it in a lower temperature due to the lapse rate. The cooler temperatures lessen the BB radiation energy profile. Are you saying the change in effective height for CO2 is less than the consensus? Or, are you saying the BB radiation profile does not change as much as the consensus prediction? Yes. You’re right. Sea surface temperature measurements used to be made by buckets thrown over the side and by engine cooling inflows. So this measured water temperature a meter or more below the surface. Today buoys measure sea surface temperatures. There has been some complicated ‘correction’ algorithm made to make these diverse measurement systems compatible. In any case they end up being sea surface temperatures rather than 2m air temperatures as is the case for weather stations. 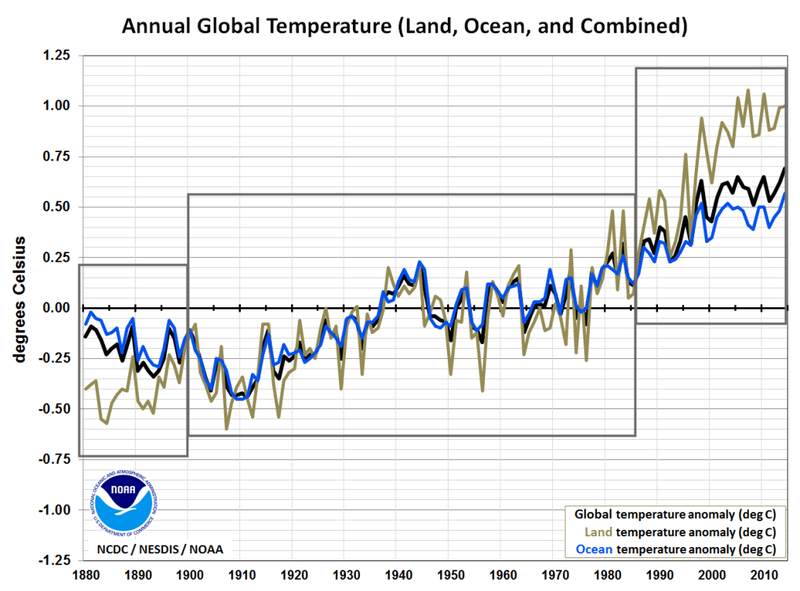 Recently there was an attempt to ‘blend’ the two together http://www.climate-lab-book.ac.uk/2015/an-apples-to-apples-comparison-of-global-temperatures/ but that was based on model differences. Satellite data measuring tropospheric emissions does avoid some of these difficulties. Your comments regarding IR radiation are correct. The hotter the land the higher the IR loss. However there is an energy imbalance with solar heating. This drives convection, evaporation and thunderstorms which are more efficient at shifting heat up to the tropopause and drive Hadley cells moving heat to higher latitudes. Lets wait and see if the satellite data diverges from the surface data. It certainly would prove your point regarding El Nino. Don’t count on RSS though contradicting GISS. I think we “missed the boat” here :-). Since about 1980, virtually all SST is from buoys, very little from ships. The readings from ships, for most the 20th century were taken from the cooling water intake to the engines etc (not via buckets, or canvas bags, etc as back in the 19th century). So, once again, the SST readings are WATER temps NOT air temps. There are different types of buoys, but most of them take their water temp at around 1 – 1.5 m below surface, while some at around 6 m below the surface. The Argo buoys do something quite different and go down to quit great depths. Many, if not most. of those “gizmos” also take both dry bulb and wet bulb air temps. However, the “powers that be” decided to go with the water temps, since the recording of air temp with humidity requires a more complicated adjustment, and then they would need to also match that up with land dry vs. wet bulb … they just didn’t wan’t to go that route for a bunch of “hand waving reasons”. … so, as before, SST’s have a very dubious history and “interpretation”, particularly as the ICOADS source (raw) data is massively “bent” by Had/Met to create their HadSST3 etc. … as before, directly combining water temp departures with air temp departures is a meaningless proposition, they represent two completely different physics/dynamics etc. Have a look at the actual location of SST stations, they have NOTHING to do with a 5×5 grid, just like your spherical triangulation is a pure artefact of HadSST’s grotesquely bent data, and your are triangulating something akin to fiction created by Had/Met et al. … we should not loose sight of the fact that GAT has relatively little to do with climate modelling. I am not sure what you are trying to say with the para citing “convection”, “Hadley cells”, etc. Are you suggesting that the planet is loosing heat to space by convection? I trust that is not what you mean, as that would be nonsense. If what you mean is that convection takes heat to the top of the troposphere, and then radiative flux from the “warmed top of the troposphere” is the primary mechanism for heat loss to space, then that too is nonsense, see my explanation to Ron Graf’s comments above, and replace TOA with Top of troposphere. I guess I don’t understand what you are trying to say, perhaps you will clarify. Finally, for sure there is something wrong in your last para. RSS/UAH have been “contradicting” GISS/NCDC/HadCRUT since at least 2005. The “contradiction” is that the land based records are diverging massively from the satellite based records, especially since 2005. At this point, we cannot be 100% certain “which is contradicting which”, but given that the land based sets have been receiving a very large number of very large “administrative adjustments (AA’s)” (especially starting around 2005), one has to question the “quality/reliability” of an “instrument record” that requires this amount of frequent/massive manipulation. That is, if the instruments are “good”, why would their results require frequent/massive manipulation. All this is very easy to see, separate from the charts I had sent you already, via Dr Humlum’s monthly, which shows each data set from each source compared in a single document, every month, including “AA’s” etc. e.g. here (http://www.climate4you.com/Text/Climate4you_March_2017.pdf). … it is somewhat interesting that RSS/UAH have released up to Apr 2017 showing the large el Nino reversal/cooling, but Had et al are still only showing up to Feb 2017, which is just prior to the massive (normal) el Nino “reversion” … hmmm, what are they waiting for? … you will also note that the “divergence/contradiction” is now much greater compared to the 5/95% error bars. The surface records are implying a .15C/decade warming while the satellite records are showing something closer to “0”. That is, for the last 20-25 years, land-based have been going ballistic at .15C/decade, while sat-based is about flat for the entire period (save for ENSO spikes etc). … though, I can hardly wait to see the next 6 months at least, as that might already be sufficient to completely nail the land-based coffin shut! Still, I have great respect for the capabilities of the IPCC/UN “spin factory”, so the their “story” is what may form the greatest entertainment … anyway, its a bit too early to get too excited, lets see how it unfolds. I must admit that the way that floating buoy measurements get gridded into 5×5 grid cells is not exactly clear to me. For any given month a changing set of measurements get combined into the average for that cell. That is probably why they work with anomalies. Corrections made for older ship measurements clearly will affect the trend. The claim is that these corrections actually reduced the warming trend. The comment about convection and Hadley Cells just reflects the fact that the net radiative heat loss occurs at high latitudes. At low latitudes the balance (solar-IR) is positive. That excess heat is transported to high latitudes by convective cells (weather). Yes climate4you is a great resource. I am pretty sure that April’s temperature anomaly will bring the surface data back into line with UAH/RSS. Lets wait and see. … I leave my comments re the “5×5” measurements for the end. As I commented in my reply to Ron Graf, the planet’s radiative heat loss is “from the planet” (i.e. from the solid and liquid bits). Gases cannot support the type of conditions required for things like Black (Grey) body radiation. You will need to hit the books on quantum mechanics and statistical mechanics and educate yourself on how these thing work. … I think stepping back a little and thinking about the big picture may help. Also, as per my earlier comments, you can avoid the strict physics route. If you look at satellite spectra, they tend to be somewhat well approximated by Plank’s (Black Body) formula. For example, one of the easiest data of this type to find on the web is some NIMBUS4 data from 1970. The spectra from anywhere in the central latitudes, e.g. Mediterranean, approximate BB driven by temps of 280’ish K (i.e. 10 C, which is not unreasonable for April Mediterranean Sea “at the surface”), with spectra implied higher values over the Sahara of approx 300-320 K (i.e. 30 – 50C, which is not unreasonable for the Sahara “at the surface”), etc. The spectra over poles are less well approximated by BB (which is another interesting discussion), however, if we allow classical BB for, say, the Antarctica, the BB approximates at around 220’ish K (i.e. -50C, which is not unreasonable for the Antarctic “at the surface”). At the top of the troposphere, even if BB were possible, it is around 220K pretty much everywhere. Thus, it is massively far from the spectra implied temps, save for that at Antarctic. Also the top of troposphere temps do not show the range of variation seen in the spectra. By contrast, the surface temps approximate well with the spectra. As such, even ignoring strict physics/theory, just reviewing the data tells the story, and it tells a “surface” story, not a “many km up in the air” story. … so again, the convection, Hadley cell, etc bits are virtually inconsequential compared to the “glow” planet radiates at the surface, and for the most part, passes through the atmosphere unhindered (save for a few W/m^2). … Put differently, take some glass or Perspex (Lucite for yanks) or whatever thin skinned sphere with no thermal/optical properties. Then, fill that container with “atmosphere” at, say, 220K (uniform), what do you think the “radiative flux” of that would be? By contrast, take a comparably sized cannon ball at 270K; what radiation/spectra would you expect for that? Do you think the two “balls” would have fluxes, spectra, etc that are similar in any material way? … here is a hint, don’t forget the 2nd Law of Thermodynamics. Re HadCRUT temps, just today I see they published their Mar data (yesterday it was still only up to Feb), and today is May 8 (not sure why they are so slow). All of their numbers for Mar are higher/warmer compared to their numbers for Feb: increased by approx 0.02C. By contrast, RSS/UAH show a MASSIVE cooling (UAH changed by -0.16 C, i.e. a enough cooling to counter a decades worth of IPCC warming) just for Mar. So, Had/Met is going MASSIVELY in the opposite direction cf. the satellites, and very much in contradiction with ENSO symmetry, and of course the “contradiction/divergence” between “surface” and “satellite” increases hugely. … as per earlier, although we already have provably at least 12 years of (very substantial) data divergence just on temps (and more than 20 years of real temp vs. IPCC et al model divergence), given the particularly large size of the last el Nino, and given that most if not all of the temp divergence seems to appear as a massive “land ENSO asymmetry” discrepancy in the surface temps (the SST’s don’t show quite as abhorrent ENSO asymmetry), the next even 3 – 6 months (though to be safe, probably 6 – 12 months) may further demonstrate the serious flaws in these temp measurement GAT calc processes. I am in the process of producing a somewhat more detailed document explaining surface temp collection methods/issues, and particular on the SST side. Those facts are then combined with some code I wrote that produces different methods of “temp surface” fitting (and also show TRUE irregular spherical triangulation mesh etc, c.f. the 5×5 “irregular” mesh in your post produced by Had/Met), and used to demonstrate how and why all the “spherical triangulation” (and now I see the even more fanciful “icosahedral” bits) require a very different understanding of physics/maths compared to that in your posts … my “day job” is a little pressing at the moment, so not sure when I will finish that doc … but I will email it to you ASAP. Looking down, it shows the atmospheric window, from about 800 to 1200 cm-1, radiating at an apparent temperature of about 268K (the ice). Then there is the big dip from about 600 to 700 cm-1, radiating as if at 225K. That is the GHG range (mainly CO2). Looking up you see the converse. 600-700 is now about 267K, being the near surface air temperature. That isradiation from gas. And the window has very little – GHGs are inactive there. It’s just normal volatility. Surface temperature in April is down about 0.15 °C. That takes it back to just below Jan, but above December. I had already taken the position that I would not interact with Mr Nick Stokes due to his repeated pattern of dishonesty and repeated proven “bush league” mistakes, and which he did not have the courtesy or the professionalism to take responsibility for. It seems he did not even have the courtesy to stay out of my remarks here. I will take the charitable position that perhaps he thought I would not entertain his further jabs purely on the earlier issue of interpolation and related matters of triangulation. On the basis of that charity, I provide a response, and my final and only, for ever, response to Mr Nick Stokes. … I trust after this, he will have the courtesy to stay out of my posts. Of course, I don’t expect reason or courtesy from Mr Nick Stokes, but if he should further act in bad faith and with dishonour, I will leave that to him and him alone, and let the world see him for what he is. 1) Mr Nick Stokes, your comments Re “radiation” are complete and UTTER gibberish. Gases cannot support anything vaguely resembling BB radiation …. WHICH WAS THE ENTIRE POINT of the earlier discussions. Gases can only radiate at a very small number of very narrow frequencies. This is extremely well understood/proven in quantum mechanics. That is the basis for the entire filed of spectroscopy, and how we determine the composition of stars, atmospheres on other planets, etc. To talk sensibly about the heat leaving the planet as per the original Clive “night” heat loss discussion, and indeed to sensibly talk about the net heat balance between the planet and space, one CAN ONLY depend on the (approx) BB radiation from the solid/liquid portions of the planet. Clive and Ron Graf seemed to have taken the position that somehow the atmosphere takes all the heat from the planet, moves it to the TOA or something like that, where then the gasses radiates out the bulk of the planet’s flux. That of course is just nonsense, as I explained with several different approaches. Clearly you could not grasp even the very simple point of the gas planet vs. the cannon ball. I can’t quite figure out what you are trying to say with the two spectra you showed since spectra at the poles are notoriously complicated and have VERY LITTLE to do with flux from most of the rest of the planet. If, you are somehow trying to use that to suggest that it is indeed the atmosphere that is somehow “generating” the flux to outer space … then, you sir, are talking utter and complete gibberish. 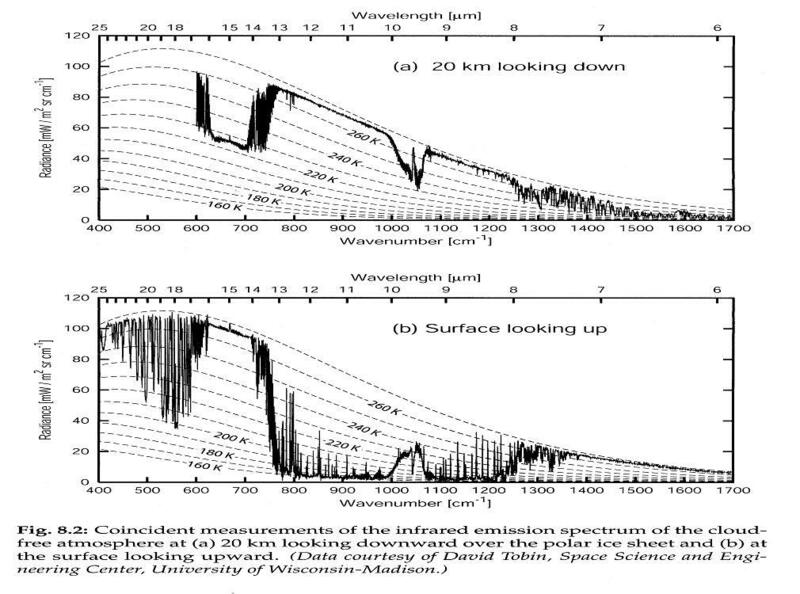 As I indicated repeatedly, there is easily obtainable spectra on the net, such as the IRIS spectra, for example here (http://claesjohnson.blogspot.ca/2013/01/how-to-interprete-atmospheric-spectrum.html). The original paper by Hanel and Conrath did not superimpose BB curves as shown on the cited page, but that too is available. VERY CLEARLY, each portion of the planet emits a spectra that is reasonably approximated by Planck’s BB. NOTE ALSO, the “brightness temperatures” are consistent with the surface temps of those regions at those times of the year (and NOT consistent with TOA etc temps). For example, IRIS shows brightness temps of 310K/40C in the Sahara, 280K/10C in the Mediterranean, and 220K (-50C) in the Antarctic. … your cherry picked Alaska nonsense, if anything, just proves the same as the Hanel and Conrath et al results did for the Antarctic .. but then, that proves the opposite of your position … what a surprise. … so your cherry picked Barrow, Alaska bit attempting to contort some baloney is crushed by the entirety of physics. As it happens I have the entire IRIS database, along with other satellite etc spectra. They all show exactly for the planet what Hanel and Conrath et al do in just three spectra. 1) Another type of dishonesty in your pattern of behaviour. TO begin with, your “down looking” spectra start at around wave number 600. The vast bulk of the H2O effect occurs between about wave numbers 100 – 500. So the most important GHG’s effect has been completely omitted from your chart … there is a surprise. 2) The poles have all manner of idiosyncratic issues very different from the rest of the planet. The poles represent a tiny fraction. The low temps at the poles naturally mean dryer conditions, so of course, even if you did use proper instrumentations and not “cherry picked” data, it may still not show the full extent of what happens on MOST of the planet. 3) One of idiosyncrasies at the poles is the relatively flat “high end” of the spectra (i.e. above wave numbers around 1,100). The vast majority of the planet shows a substantial absorption above there. Just look at the link above for the Sahara and Mediterranean. If you add those areas together with the ignored/missing IR from 600 on down (i.e. all mostly due to H2O effects), then you will find that most of the “missing area under the BB curve” is due to H2O. Plus, as before, some of H2O operates into the 600’s, so there is an overlap between H2O and CO2 … so which is actually warming the planet more???? … even the IPCC admits H2O to be about four times more powerful a GHG compared to CO2 (though it may well be much more than that) … and please don’t bother responding with any of the utter fantasy that “CO2 causes H2O”. 4) I also find it true to your nature to rely on an Alaska based instrument for “looking up”. Given the tilt of the planet, and given the shallow incidence angle that far north, one would expect to see LITTLE down welling radiation due to shallow angles, diffraction, and a variety of effects that may affect a tiny portion of the Arctic, but have little to do with most of the planet. I find it LAUGHABLE that you are relying on Tyndall from 1,861 absorption data ????? TOO WEIRD, I think everybody else understands that quantum mechanics, spectroscopy, etc etc developed well after and mostly in the 20th century, that our understanding and measuring has moved very much forward in the almost 170 years since, and I don’t recall there being too many satellites around 1,861. Once again, your UTTER BULLOCKING GIBBERISH is a careful shell game taking something irrelevant and completely out of context, and applying in a manner yet again demonstrating your bush league level of understanding, and incredulity. I wont waste too much time on your last para. It is such a carefully engineered bit of dishonesty relying on “date mangling” and attempting to connect disjoint matters. Any body who just looks at the HadCRUT4 monthlies and the UAH monthlies will see immediately that the two are diverging at an alarming rate, that Had et al breach ENSO symmetry in a huge manner, while UAH preserves it, etc … your shell game nonsense won’t change any of that. In any case, you strike me as entirely contemptible and simply looking to fabricate any kind of rubbish to pick a fight. … I will NOT respond to any more of rubbish, unless there is legal reason to do so. DrO, forgive I am not a physicist and just trying square what you are claiming relative the the climate science “consensus,” which I think Nick is just reciting. I did some research and confirmed that you are correct that gasses do not emit in a black body spectrum. They emit in the same discrete bands that they absorb in, which is in accordance to Kirchoff’s Law. It’s tricky because the Sun emits in a black body profile in accordance with the temperature of the surface of the atmosphere. But the Sun’s atmosphere is plasma, not a gas, which makes a big difference in BB. So notwithstanding back radiation warming, like that experienced on a cloudy night, CO2 does not seem to have a way to change the BB profile of the Earth, or any other gas at the TOA. I’m pretty sure this goes against what many in the consensus claim. Nick, can you point out how CO2 could change the BB profile? The top two are respectively Sahara and Mediterranean, so the land component, between 800 and 1200 cm-1, is correspondingly warmer (and much colder for Antarctic, which seems to be winter). But there is the same dip, and again to about 220K. The tropopause is much the same temperature at all latitudes, just higher away from the poles. So he wants to attribute the reduced radiation to water vapor, rather than CO2, despite the fact that it is right in the CO2 region. But wv is a gas too, so it doesn’t support the nonsense that gasses can’t radiate. He’s just blaming a different one. It’s clear from all these spectra that we aren’t talking about a single BB spectrum. It is varied. Update – I have added some colored annotations to the Claes Johnson plot. Yes, the spectra at the TOA are basically the ground profiles with additions and subtractions in bands corresponding to the atmosphere’s radiative gases. Re-reading Kirchoff’s Law, the emissions and absorptions are only identical in thermodynamic equilibrium. Since the surface is warmer than the TOA the gas bands absorb more than they emit, particularly at their higher energy (shorter wavelength) bands. The difference between the emission and the absorption energy is the energy to used to narrow the gap in temperature between the ground and the TOA toward equilibrium. In Claes diagram for land, for example, part of the plot follows the 320K profile, which is presumably the ground temperature (the hot sand). Then bites are taken out by the atmosphere, with the bite at 14-16 microns so close to saturation that it begins to draw a profile at 218K, which one could presume was the temperature at the TOA that day over the Sahara. Interestingly the Antarctic was experiencing an inversion where the TOA was warmer than the ground since the 14-16 m band was at a higher temperature profile. This shows CO2 enhancing the Earth’s outgoing ratiative flux, actually cooling the planet. Although this is likely only in sporadic cases in polar winters, it gives a mechanism for CO2 to be warming the poles directly with enhanced back radiation at 14-16m. If all the above is correct I have a much better understanding of the EGHE. DrO is correct in that gases do not emit in BB (except in the short snips of their bands). In the cases where the bands are saturated at a lower level by H2O there is still emission by H2O in those same bands, governed by the temperature of that H2O. So to the degree there is still a temperature differential between the location of saturation there is still more energy to be absorbed before escape to space. Nick, Clive, DrO, or anyone can correct my understanding. I find I ned a way of thinking about gas emission and spectra, and it goes like this. You can think of an absorbing gas as consisting of a random distribution of small black spheres, which are observed with a narrow band IR filter – imagine you have IR vision. The absorptivity at various frequencies is emulated by varying the radius (absorption cross-section). You can show that such a distribution will absorb like Beer’s Law. And if they radiate with the ambient temperature, they do so again with temperature dependence from Planck’s Law, and the same radius is appropriate, from Kirchhoff. If you look down at atmospheric window frequencies, the spheres have very small radius, and you see the surface, with intensity given by its temperature, as shown on the spectra. But if you look in the CO2 range, the spheres are big, and you will only see ones near TOA. If you look at the peak frequencies, they will be very big indeed, and you may only see a few metres. But it doesn’t matter whether you see to a few metres depth, or a kilometer or so, because either way you are seeing spheres of much the same temperature. In fact, you can’t tell the difference – if you have ever looked at glowing near white-hot steel, you can’t see surface details, because the temperature is uniform. In the same way you see no detail inside a glowing cavity. To see a spectral difference, you have to see through to depths where the temperature is significantly different, and then of course you see a mixture. That is why there is the long flat section in the CO2 bite. It is seen best in the Alaska spectra, which have higher resolution. I showed them because they were actually taken simultaneously, from above from a NASA ER-2 aircraft, and from below from a ground station. Here is my simple picture. Incoming solar radiation heats the earth’s surface. The surface radiates as a black body at temperature Ts. The atmosphere consists mostly of diatomic molecules (N2, O2 Argon etc) and triatomic molecules (H20, CO2, O3). Only triatomic molecules have vibrational quantum excitation modes in the Infraed. 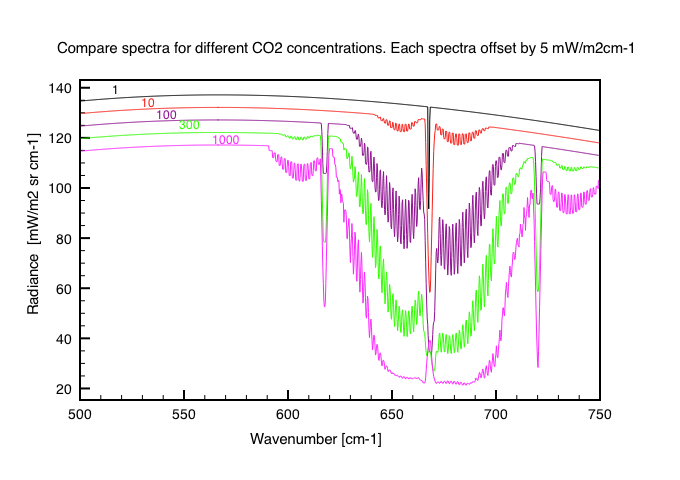 H2O has a rather broad wavelength spectra whereas CO2 has just 3 main bands. On earth only the 15 micron band is significant. All quantum absorption lines have been carefully measured and are tabulated in Hitran. Gravity generates an exponential falloff of density with height. H2O, CO2 and O3 absorb and reemit IR photons in local thermal equilibrium (Kirchoff). By inhibiting the direct radiative heat loss from the surface to space, the atmosphere generates itself a lapse rate. This is because convection begins to move heat up through the lower atmosphere more efficiently than radiation. Only with a convective atmosphere under gravity can the greenhouse effect work. For each wavelength in the CO2 band there is an effective emission height where the mean-free path for IR photons is greater than all overlying layers. IR photons from this level radiate directly to space. Likewise for O3, although Clouds complicate H2O. I once calculated the effective emission heights for CO2 using HITRAN, assuming a standard atmospheric lapse rate and profile. http://clivebest.com/blog/?p=4597 This is the resultant spectra I calculated for different concentrations for CO2. The central line cross-section is so high that it emits from the stratosphere where temperature increases with height due to ozone absorption of solar photons. This means that this wavelength actually helps cool the planet with increasing CO2 levels. However the net effect is a reduction in net IR emission which has the knock-on effect to increase slightly surface temperatures so as to increase the net flux of IR photons to balance energy. Clive, if you are correct that the effective height of CO2 is now reaching into the stratosphere then that would indeed have a slight cooling effect during sunlight exposure, but only to the extent there was either some common band shared by O3 and CO2 or there was some degree of convection to transfer the energetic O3 to CO2. Otherwise, the elevated O3 temperatures and emissions ever get passed to CO2 for 15m emissions. They miss each other like ships in the night. If CO2 is cooling the high angle sunlight in the stratosphere this would give preferential benefit to the tropics and nil benefit to the poles. Right? Nick, Clive, does anyone have a hypothesis that warms only the Arctic and not the Antarctic? One clear difference is albedo feedback – less ice/snow with warming and so less sunlight reflected. The SH has very little land that is so affected; there isn’t much snow/ice outside Antarctica, and Aa is still too cold for ice to melt. While NH has Siberia/canada , even US. And sea ice – in NH albedo warming is in fairly confined seas, while in Aa it happens marginally at the edge of the Southern Ocean with circumpolar curren tetc. Antarctica also seems to be isolated from the rest of the world by the circular antarctic current. This pumps up extremely cold water that has travelled deep down from the Arctic ~1000 years ago. Antarctica is not going to start melting any time soon. It has been an ice sheet for nearly 50 million years. Yes, that is what has to happen, but how? The surface (ground/sea) has to radiate more, so has to receive more. The sunlight is the same. The increased down IR is the complement of the diminished up. Just as the top emission surface rises, the bottom surface lowers. The down emission we experience comes from lower altitude. The problem with increased downward IR ‘warming’ the surface is that it originates from a colder place than the surface. The earth is also being bombarded with background microwave radiation at 3K from the Big Bang. If that picture was really true then this flux would also be warming the surface, albeit by a tiny amount. Likewise moonshine warms the earth’s surface, and earthshine warms the moon. I prefer another picture. Heat can only flow from Hot to Cold. The net flux of IR photons is always upwards from the surface through the atmosphere and out to space. Photons are absorbed and re-emitted by CO2 molecules in random directions some up and some down with a net flux that depends only on the local temperature, which diminishes with height. All that really happens as CO2 increases is that the number of photon scatterings for a given height increases both upwards and downwards. The net upward flux is diminished. Nick, I agree that NH ice albedo is important, however, wouldn’t any gradual change have time to equilibrate throughout the planet, raising anomalies everywhere in a few years? Do you know how well the models are replicating the polar ice? Clive, it seems to me that CO2 would still cause warming in a low convective atmosphere as in Mars. There would be nothing to compete with the back radiation. OTOH, in the Earth’s atmosphere I imagine convection would overpower most of the effect, and humidity would obliterate it. But there could be a little effect in low humidity areas like deserts and poles. I should have said a lapse rate rather than a convective atmosphere. 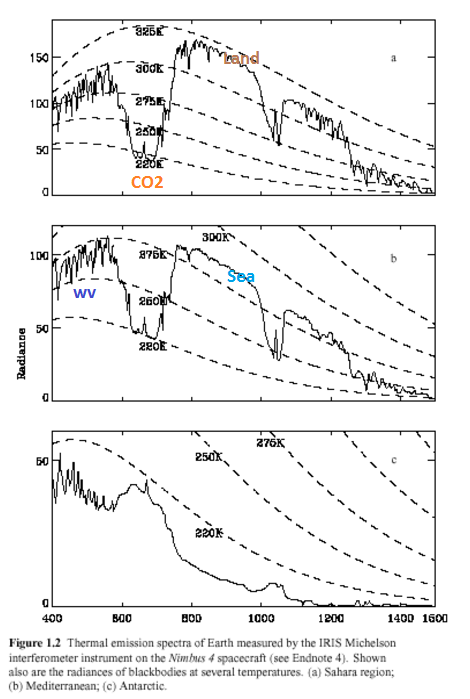 At any rate above the tropopause more CO2 increases radiative cooling to space. The greenhouse effect only works within the troposphere. I agree that radiation cannot warm from a colder place but it can slow cooling relative to the lack of any radiation. For example, clouds radiate at night to make it warmer relative to a clear sky where there is less back radiation. The night does not warm but it slows cooling because the gradient is diminished. I think Nick is correct that the back radiation is there but does not govern the gradient. It only acts a one of several means of feeding into it, helping it equilibrate. Clearly convection dominates the lapse rate. And, where there is water vapor it would dominate over CO2. And, where there is dynamic transpiration it dominates over static properties of water vapor.